It's common in any service industry to say, "Tipping is not a city in China!" Gratuity is a very large part of the income for a barber or stylist. It also shows that you value this person's service and the relationship between the two of you. Much like a restaurant server who has regular customers, a barber or stylist may often perform at a higher level for clients who tip well. But what are the customary rules for how much to tip your barber or stylist? Generally speaking, for good service, you should tip 15 to 20 percent of the entire bill. Tip more for exceptional service or less for what you consider to be inadequate service. Tipping is your way of saying "job well done," so tip more if the person performing the service has gone above and beyond what is expected. 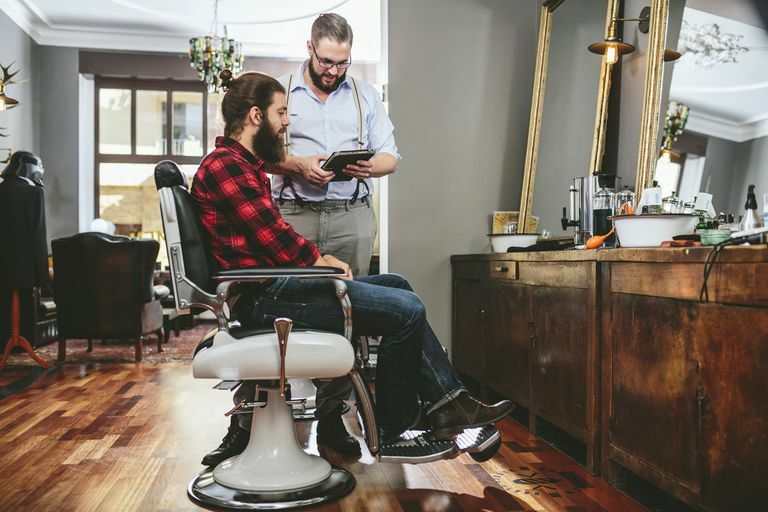 If you don't feel like you can tip well, it may be time to fire your barber or stylist, but if you like them and enjoy their service, tip as much as you can afford. If someone works on you other than your barber or stylist (such as a shampoo person or shoe-shine person), give them a few dollars as well. During the holidays, it is generally acceptable to tip the normal cost of a visit. For example, if you normally pay $30 for a haircut, then you should tip them $30 before the holiday. It's a nice way to say "thank you" for a year's worth of great hair. If you have a close relationship with your barber or stylist, you might also include a small personal gift that reflects his or her interests as well as a monetary gift. While it's a subjective judgment, good service is when the barber or stylist listens carefully, has a pleasant attitude, and takes the amount of time necessary to give a great cut. An exceptional barber or stylist will be engaging, entertaining, quick to offer suggestions on how to better wear your hair, and keep an immaculate work area. Tip more for exceptional service. Barbers and stylists should receive less gratuity if their area is not clean, if they don't listen well, or they rush through your haircut. Also, if they talk on the phone while performing your service, that's simply rude and cause for less of a tip. Of course, a bad haircut should also result in a lower tip. That said, if your barber or stylist is guilty of any of these offenses, find a new person to cut your hair. For many years, it was considered inappropriate to tip the owner of a shop or salon who also styled and cut your hair. But it's done more and more, and most owners say that while they don't expect tips, they always appreciate them. If you'd like to leave a tip for the owner but aren't sure you should, take your cue from the receptionist when you pay your bill. If she asks if you'd like to leave a tip, that's a signal that you may. When you tip your barber or stylist well, it does not go unnoticed. It speaks volumes about how you appreciate their work. Barbers know who their great tippers are and will almost always go the extra mile to make sure customers know they're appreciated. And tips just don't have to be about money. Bring your stylist lunch or a coffee at your next appointment.